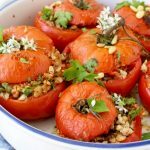 Stuffed Tomatoes or Pomodori alla Lucani, a lovely Italian dish from Basilicata made of baked sweet tomatoes stuffed with a toasted bread crumb and pine nuts mixture. 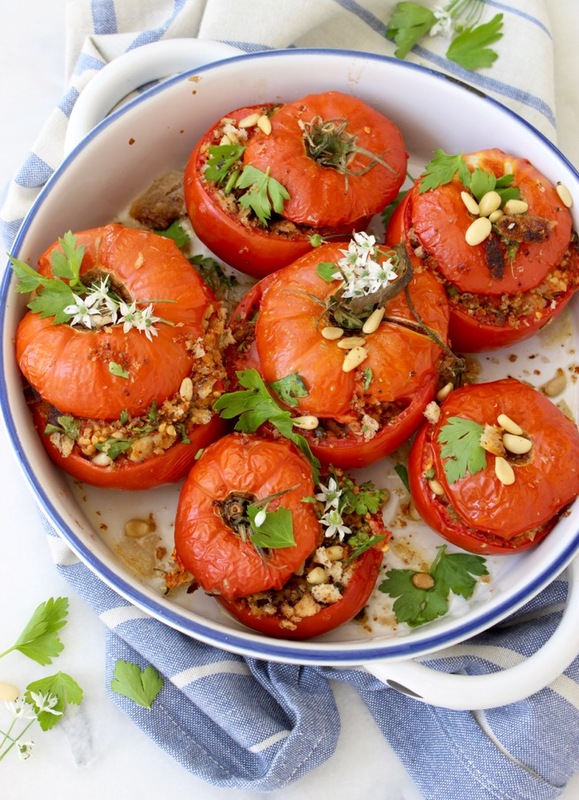 I have the loveliest Italian stuffed tomatoes recipe for us today. You guys, I just can’t let go of the tomatoes season quite yet, especially as we just harvested a nice batch of grandpa’s heirlooms. We’ve been living on his cucumber tomato salad all summer long, but to make a meal of things I decided to stuff some as well. 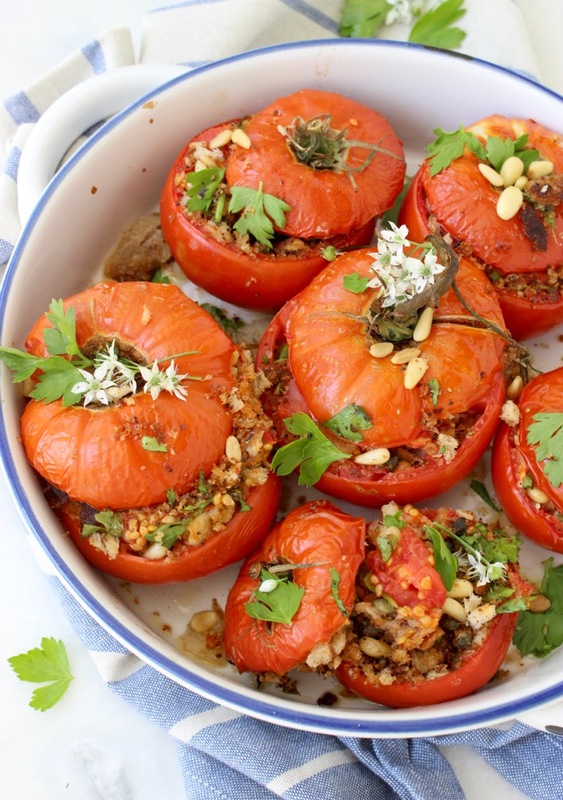 There are quite a few different variations of stuffed tomatoes out there, just google it. I stuffed mine Basilicata style, the way they do it in Southern Italy, with toasted bread crumbs and pine nuts and infused with a little anchovy flavor. For all you vegans of the world, just leave out the anchovy and you are set. Many people like to add raisins to the filling as well, but I really wasn’t feeling it today. You are free to add a handful of those in there if you like. Cut the tops off of the tomatoes and carefully scooped out the pulp. Seasoned the inside of the tomatoes generously with sea salt. Toasted some breadcrumbs with pine nuts, garlic and anchovies to make a filling, then mixed in some parsley and lemon zest to brighten things ups. Stuff the tomatoes and baked them for the 25 minutes with a little white wine on the bottom. 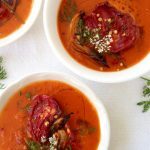 To keep your stuffed tomatoes from drying out, make sure to spoon some of the reserved tomato pulp on top of the filling before covering with the tomato tops. The capers will add plenty of saltiness to the dish and so will the anchovies, but make sure to also taste the filling as you and add more sea salt if needed. In the bowl of a food processor add the stale bread and chop until coarse bread crumbs form. Set aside. In a large skillet on a medium low flame add the olive oil and anchovies. Sautee together for a couple of minutes until the anchovies melt into the oil. Stir in the garlic and cook for just 20 seconds or so until it starts releasing its flavors. Take good care not to burn it. Add the bread crumbs and toss to coat well in the olive oil anchovy mixture. Toast for a few minutes together until the bread crumbs are golden brown. Mix in the pine nuts and capers and toss everything to combine. Taste and adjust seasonings with a pinch of sea salt if needed. Stir in the parsley and lemon zest in the bread crumb mixture and set aside. 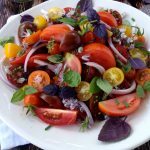 Using a sharp knife cut a slice off of the top of each tomato and reserve. With a grapefruit spoon gently scoop out the the tomato pulp and transfer it to a bowl. Use a fork to smash it a little bit and season to your taste with sea salt. 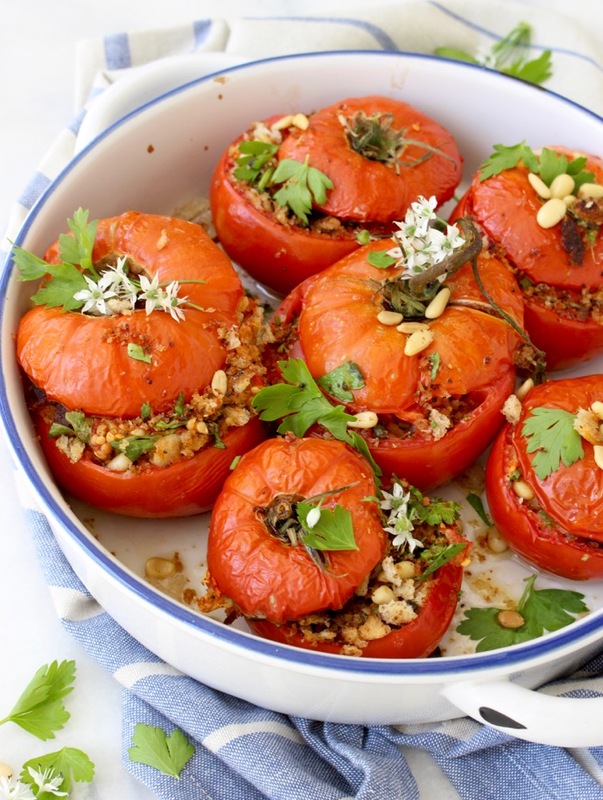 Sprinkle the inside of each tomato with some of the sea salt and fill with the bread crumb pine nuts mixture. Top with a couple of tablespoons of tomato pulp and cover with the the reserved tomato tops. 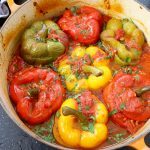 Repeat with the remaining tomatoes and place them next to each other in a lightly oiled baking dish. Pour the wine or water in the bottom of the dish and bake in the preheated oven for 25 minutes. 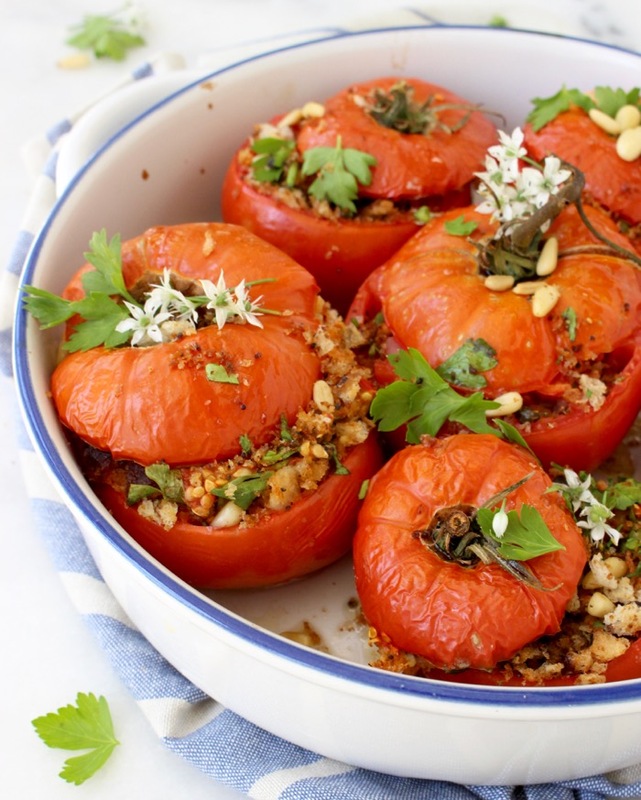 Serve your stuffed tomatoes drizzled with a little olive oil and garnished with some fresh parsley. 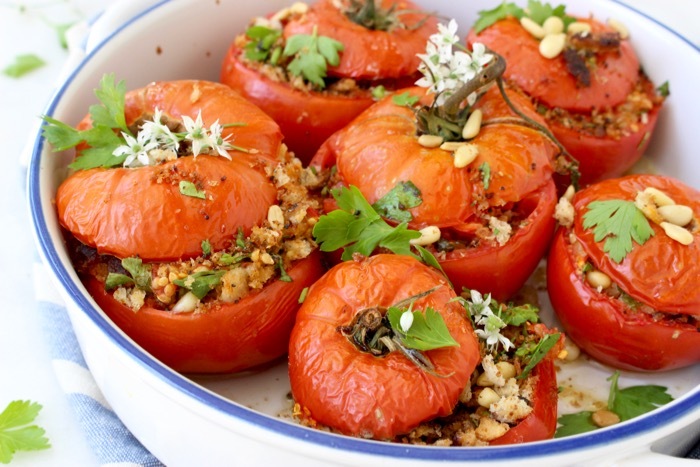 If you have any bread crumb mixture leftover, just sprinkle it over the top of the stuffed tomatoes before serving. 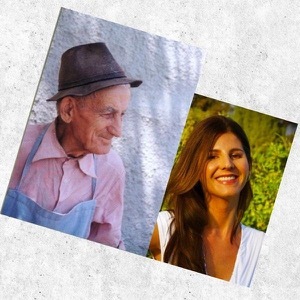 Ciao carissima ! All your recipes are just deliciosisimo ! You are great !